The Carmel forest fire, which took place five years ago this week, was a terrible tragedy - with one small consolation. The Carmel forest fire, which took place five years ago this week, denuded thousands of dunams of land, besides taking 44 lives. But within the tragedy, there was one consolation – the discovery of an ancient farming community that dates back to the Second Temple era. One of the worst civilian disasters in Israeli history, the fire destroyed over 40,000 dunams (9,900 acres) of forested land. Investigator say the fire was accidentally started by a 14 year old and that it occurred after a hot summer and unusually dry autumn, which made the trees and plants in the forest particularly vulnerable to fire. 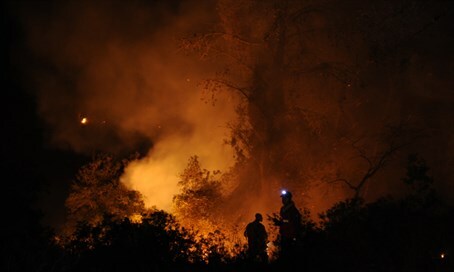 The dry conditions encouraged the rapid spread of the fire, with hundreds of firefighters using equipment from Israel and abroad to stop the spread. Workers from the Jewish National Fund have since then worked on restoring the forest, with the initial work requiring clearing the land of debris to make way for new plantings. As they have been clearing parts of the forest, workers have discovered numerous treasures that were hidden among the trees – statues, coins, elaborate clay vessels, and other items. Among the most impressive things found was a set of well-preserved agricultural terraces, which archaeologists estimate dates back some 2,000 years. The terraces had actually been photographed in the past in an aerial photo taken in 1944, but had been forgotten as the forest grew around them. At a seminar on the occasion of the fire's fifth anniversary, JNF officials discussed some of the growing strategies they were using to prevent another fire – among them planting hardier trees than the pine that had easily burned in the dry conditions. The JNF is planting fruit trees and other hardier plants, and is using livestock – mostly sheep – to eat up excess growth, so there will be less to burn and more space between growth if another fire does break out. Describing the strategy, the JNF's Chief Scientist, Dr. Omri Boneh, said that while the JNF was doing what it could, there were no guarantees – and that under extreme weather conditions another fire could break out.